Garth Stein first won my heart when he penned The Art of Racing in the Rain. That book still remains one of my favourite novels of all time. When I learned that Stein was releasing a new novel, I couldn't wait for the opportunity to read it! My initial attraction to this novel was the big spooky house and the ghost story aspect. What I was left with after reading this novel was a wonderfully written coming-of-age story. There were spine chilling elements of this novel and a lot of wonderful historical aspects. I think my favourite character aside of Trevor was Grandpa Samuel. From my very first introduction with this character he formed a soft spot with me! Stein has proven to have quite the talent when it comes to crafting riveting characters and a wonderful plot to go along with them. He also provides a great amount of back story and weaves everything together to create a spellbinding reading experience! He also provides some good ol' jaw-droppers. There were some twists in this book that I was not expecting! 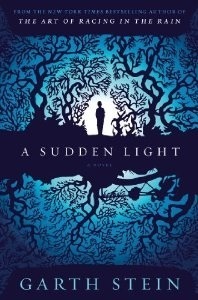 A Sudden Light packs a lot of punch and is a book that you should definitely add to your October Reading list. Curl up on the couch and crack open this novel. A Sudden Light is the whole package! Well written, with wry humor and precise prose, this is a book that will grip you as Riddell House grips its owners, past and present. Suspend disbelief and soar with the vivid imagery of the beautiful landscape and the lives of the characters, which are as tangled with thorns as the blackberry vines on this storied estate. Hmm I'm not sure that this is a good idea to move the story in this direction. I like more happy and light books. I don't think that I'll like it a lot. Coolessay was more interesting for me and I can recommend to read it too. Hello. Thank you, I will certainly live at leisure. I'm improperly, but a good book every year appears less and less, and new authors, on the contrary, more often. For a good book, there is little interesting idea - the author should have a talent for writing. Which, unfortunately, does not always happen. Sometimes, when reading an article, not even a book, on the fifth paragraph you forget what was in the beginning - so "understandable" the author wrote. Help! I'm in a reading funk!